A recent survey outlining top concerns faced by men as they age, suggests that sexual health and physical weakness were ranked as the top concerns. 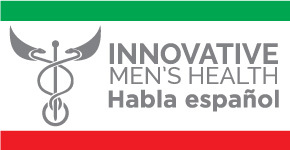 At innovative Men's Health, we are dedicated to helping men reverse issues related to aging. The LaserCap can be worn by men concerned with hair loss or thinning hair. With as little as three 30-minute treatments per week, you can experience thicker, stronger, and fuller hair in 3-6 months. The LaserCap unit is completely portable and can be inserted into the hat of your choice, it has the most number of lasers and strongest degree of stimulation, all with guaranteed results. The LaserCap has a pocket controller with a rechargeable Lithium ion battery. You can wear the LaserCap at your convenience without the restrictions of a power cable getting in your way. The LaserCap’s proprietary technology offers the first ever completely portable unit, offering new hope for men and women suffering with thinning, balding and dull hair. LaserCap utilizes 224 lasers. It incorporates physician-grade laser experience into a single completely portable and hands-free device. LLLT (Low Level Laser Therapy) uses therapeutic soft low-light level lasers and broad coverage LED diodes with pure red light at 633-670 nm. Laser therapy offers the optimum wavelength and frequency to treat hair loss. LaserCap stimulates an increase in micro-circulation of blood supplies in the scalp. This increases cellular metabolism and promotes the repair of damaged cells and weakened hair follicles. According to a review article published from Harvard Medical School (Hamblin M.R. Mechanisms of Low Level Light Therapy, Photobiology), the effects are based on enhanced cell proliferation, leading to more growth and rapid healing. This same principal is now applied in LLLT in order to repair damaged blood vessels in the scalp by promoting neovascularization, thereby providing hair follicles with the circulation they require. Research indicates that the loss of vascularization and gradual loss of hair can be alleviated by using combination laser and light therapy. The LaserCap hair treatment program uses 224 laser diodes positioned in a hands-free device worn on the head. The proximity of the LaserCap to the patient’s scalp allows for maximum effectiveness and minimal dispersion of the laser & light energy. Each treatment session is 30 minutes on alternating days of the week. The FDA has certified LLLT laser as a class 1 cosmetic device. LaserCap is safe. The laser does not emit ablative energy and is not hot. Hence, there is no risk of injuring the patient’s skin. The treatment does increase blood flow in the scalp, and some patients may experience a transient headache after the first few treatments.